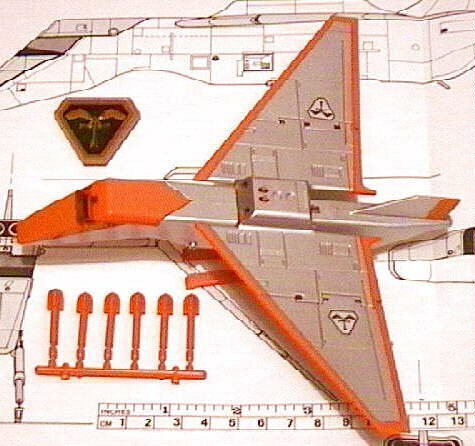 The Bandai ' deluxe ' Terrahawk action model is 6 inches in length with a wingspan of 7 inches, and is of die-cast construction with some plastic parts. The front centre of the wing has two missile launchers with separate release buttons. The whole wing is pivoted from the rear, allowing the front of the wing to be tilted upwards, the tips of the wings can be tilted downwards. The Terrahawks' independantly positionable 'claws' retract into the bottom of the craft. 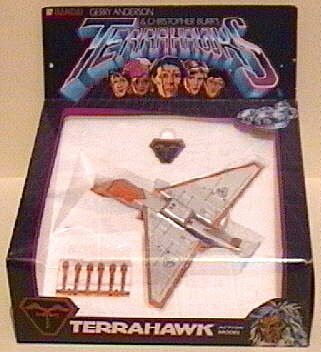 The Terrahawk comes complete with six plastic missiles, a sheet of decals, and a Terrahawk badge. 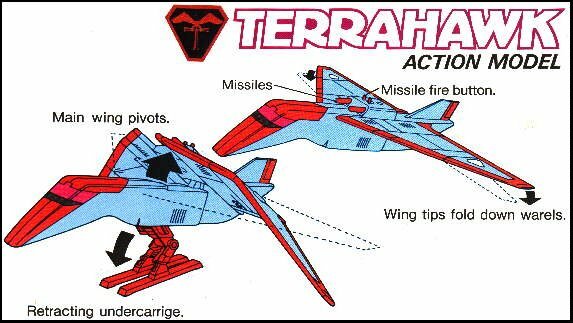 Artwork from the underside of the Terrahawk box.